– Readily available nitrogen during the vegetative phase. – Since we’re a blog for the budget-conscious home grower, let’s say that we’re using standard seeds and want to avoid an excess of potassium in the mix, so to encourage the development of more females. – Good drainage properties to prevent root rot, a common marijuana malady. – A good source of phosphorus to support bud growth during the flowering phase. Although our ebook contains the recipe we’ve found to best promote aroma development in varieties like “Pineapple Chunk”, “Blueberry”, and “Mango Haze”, here is a recipe that will help your standard seed plants flourish in the vegetative phase, producing rich, deep green leaves, and develop the root system they need to develop full, resinous buds. It is a very good idea to mix your soil far ahead of your planned grow start. This allows ample time for the microorganisms in the soil to break down organic matter in the mixture and release the nutrients into a form plants can absorb. This soil “recipe” makes about 5 gallons of soil, or enough to grow 4 or 5 plants in 1-gallon containers (You may want to top off pots with more soil during the grow – you’ll notice the soil level go down as the plants develop. A one-gallon container (milk jug with the top sliced off) will help you measure the larger quantities. – 2 gallons of potting soil mixture. You can get a large sack of this for just a few dollars at most hardware and even grocery stores. “Dollar Stores” are a great place to get this stuff cheap. – 1 gallon of compost. If you don’t have our own compost pile, ask a friend or neighbor who has a garden. Choose dark, well decomposed soil from a lower part of the compost pile. Beware of still-rotting grass clippings, banana peels and the like – these may carry pests and mold that could hurt your plants. – 1 gallon of worm castings. This is the pricey part of the soil recipe. If you have a fishing supply store near you, they may be able to give you worm castings, and a few worms won’t hurt your soil at all! Otherwise, try searching the web (eBay, etc). Some small farms sell worm castings to organic gardeners to enrich their soil. – 1/2 gallon perlite. Check the potting soil you use for perlite – If it is already present in the mix, you don’t need more. Just use 1/2 gallon more of the potting soil. – 1/2 gallon sand. Just don’t use sand from a beach on the coast without rinsing thoroughly to remove salt! NOTE: I should mention that we are purposely avoiding “coco coir” in this soil mix. Coco coir is a substrate that is gaining popularity among marijuana growers. It has many excellent properties for cannabis cultivation, one of them being high levels of potassium. Although a good supply of potassium is great for flowering, we are mixing a soil that is high in nitrogen, phosphorus, magnesium, and calcium, but has only moderate amount of potassium in order to increase our odds of raising female plants from standard seeds. Pour the above into a bin, and turn it over and over until it is well combined. I say “turn it” because you don’t want to stir or stamp it together, which forces air out of the soil. Oxygen is our friend – we want well aerated soil that encourages the growth of beneficial microorganisms. 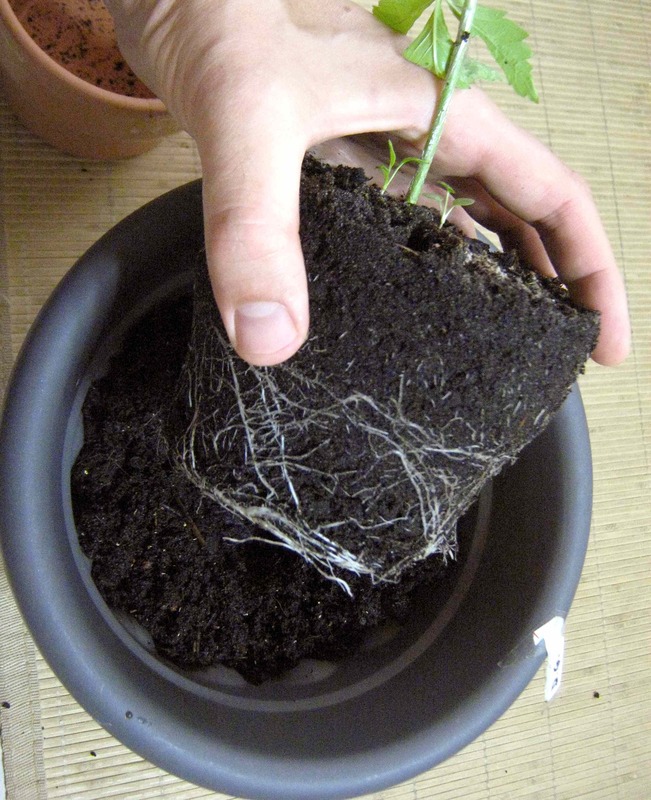 Use a trowel or your hands to lift the soil from the bottom up and keep it “light and fluffy”. You should turn the soil every couple of days to keep oxygen levels up. – 1 quart (liter) of coffee grounds. Coffee/espresso bean grindings are high in nitrogen, which must be released by decomposition. If you have worms in your soil, they will love this. Fungus and microorganisms will also break it down, and this is why I recommend mixing the soil in advance. – 1 pint (500ml) of dried, ground eggshells. Save them along with the coffee grounds at breakfast. Dry them on a windowsill, and gringo to powder in a mortar and pestle, or by running them through the coffee bean mill. The calcium carbonate in the eggshells buffers the soil against the acidity of the coffee grounds. A perfect match. – 1 quart of rice husks. These not only help soil drainage, but provide phosphorus and potassium, which is released over time as they break down. Get them at any store that carries whole foods. Alternately, use wheat germ, which is more readily available at supermarkets. – 1 teaspoon of epsom salts (magnesium sulfate). Magnesium supports chlorophyll production. Even if your soil mix were already rich in magnesium, it is hard to O.D. your plants on Mg; even relatively high concentrations are not toxic to cannabis. Turn these ingredients into your soil, and water it with 2 quarts (2 liters aka. 1/2 gallon) of water in which you dissolve 2 tablespoons of unsulfured molasses. Yep – plain old molasses from the baking supplies section in the supermarket. The “cannabis magic mix power bud insanity” type fertilizers are often not a lot more than a glorified mix of molasses solution and tomato fertilizer. Molasses not only provides some nutrients directly to the plant, it also works to boost microorganism activity in the soil, which frees up many more nutrients from the soil. OK, you are ready to rock. Well, ready after about 6-8 weeks of letting this soil mature… If you are in a hurry, I would recommend ready-to-use soil mixes from Fox Farms or Canna Terra. But part of the satisfaction of growing your own are the hands-on steps like this. When you know exactly what your plants are taking in, and can consume your medical Mary Jane with an even greater peace of mind.